David built the first aquaponic farm in Los Angeles County and developed an urban agriculture educational platform called THE ART & SCIENCE OF AQUAPONICS for public schools, universities, and the general public, through a company he founded- Evo Farm LLC. 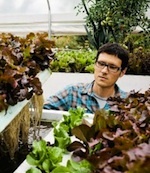 He consults on design, feasibility assessment and installations from residential to industrial scale aquaponic farms. He developed Nano Farms™ a product line of recreational/ educational scaled aquaponic systems that grow the most amount of food in the least amount of space. Prior to urban farming, he produced a number of documentaries including most recently DESIGNING HEALTHY COMMUNITIES, (a 4-hour series that aired on PBS) which looks at the built environments impact on public health, and and GROWING GREENER SCHOOL (also on PBS). The pursuit of the urban farming life is a natural progression for him- from producing ‘food for thought’ to producing thoughtful food. David is the Treasurer of the Aquaponics Association. He also has served on the Aquaponics Subcommittee for California Fish and Wildlife, and the Urban Ag committee for the Los Angels Food Policy Council.